New data from Hawaii’s Department of Business, Economic Development and Tourism (DBEDT) shows energy customers in the capital city of Honolulu are increasingly interested in adding battery storage to rooftop solar, evidence by an 18-fold increase in the number of permits issued for residential projects. The new report from DBEDT, based on data from the city’s Department of Planning and Permitting, finds 731 residential battery storage related projects received permits last year — compared with a mere 40 in 2016. And the analysis concludes it is more cost-effective to install solar and storage together, as opposed to adding batteries down the line. Installing both at the same time saved customers $7,700 on average, according to the report. For the last three years, Hawaii regulators have capped the number of solar customers sending excess energy back to the grid since they terminated the state’s net metering policy in 2015. Consequently, those caps have boosted residential storage investment, according to DBEDT’s report. “We are seeing an upward trend in battery storage in the area of renewable energy development, as well as the cost of installing PV systems dropping significantly during the past few years,” DBEDT Director Luis Salaveria said in a statement. The Hawaii Public Utilities Commission eliminated retail net metering in 2015, and replaced it with a Customer Grid Supply (CGS) and Customer Self Supply options. The CGS program. allows customers to send energy back to the grid, is the most popular, and has previously hit caps on customer participation. Many customers are now switching to the CSS option, which was designed to incentivize energy storage. 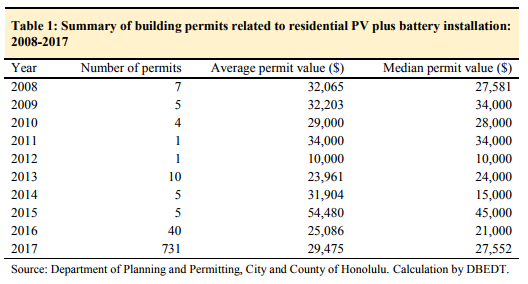 IDBEDT’s report notes that the first permit issued for a residential solar+storage installation was issued in 2008, and the number of building permits never exceeded 10 until 2015. But that is the point where interest in storage began to take off following the PUC’s net metering decision. Of the 731 residential solar+storage projects permitted in 2017, 39% were completed by the end of the year, DBEDT said.